Here is a video of me telling the story of a five-year old girl who saw her mother's face for the first time in my office. While the story is very touching, it is also quite disturbing. This is not supposed to happen. Untreated vision problems in children can be very damaging. 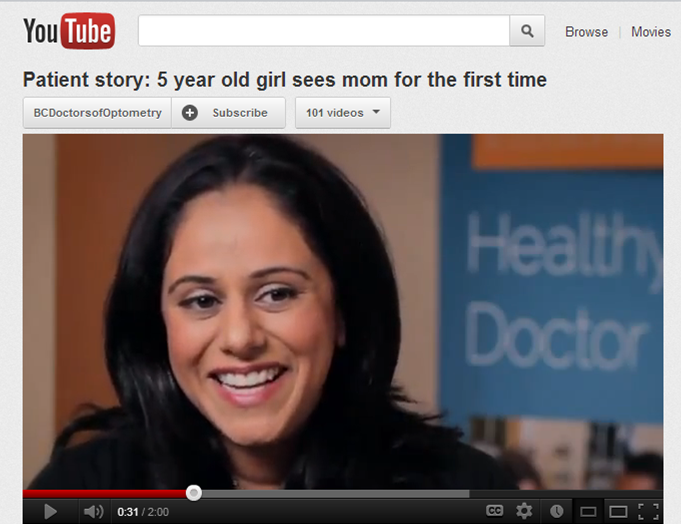 Unfortunately, I'm probably not the only children's optometrist to have had this kind of an experience. One in five children has a vision disorder. Not knowing any differently, many of these children accept poor vision and other eye problems as normal. If left unchecked, serious long-term effects can result. That is why experts recommend that a child should have their first doctor's eye exam (by an optometrist or an ophthalmologist) at six moths of age. Poor vision in the first five years of life deprives a child of critical early stimulation, development and learning. Remember that 80% of our learning happens through our visual system. The last two videos are two important public service messages created by the BC Association of Optometrists on the'importance of children's eye exams. To learn all about children's vision and eye health visit www.kidsvision.ca or www.visiontherapy.ca.